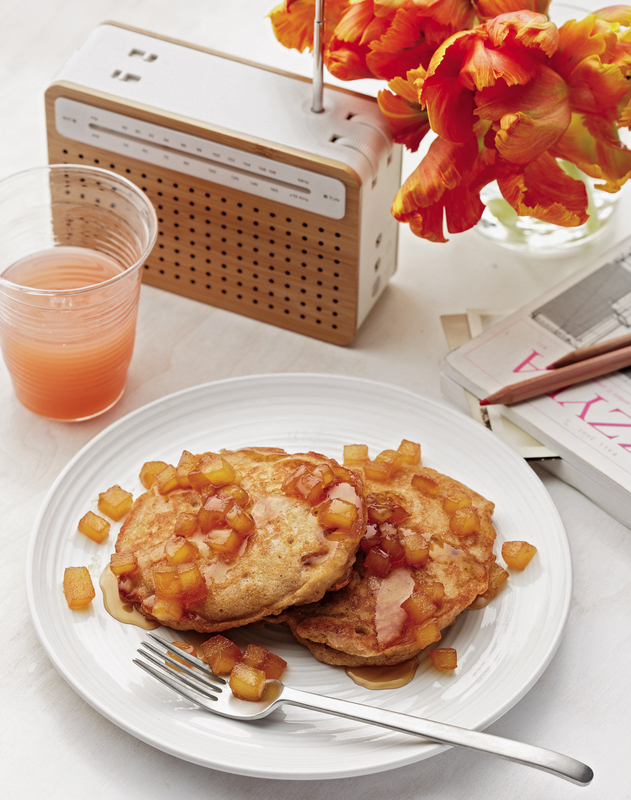 Above: Apple Pancakes from “Gluten-Free Breakfast, Brunch & Beyond” by Linda J. Amendt (recipe below). All photos (c) 2013 by Tara Donne. 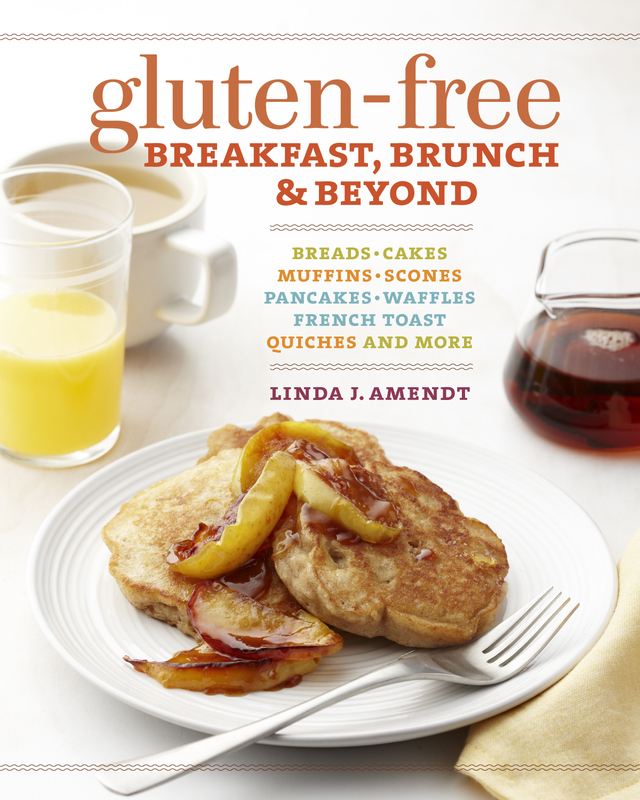 Note to readers: Leave your comment below, and I’ll choose one at random to win a copy of “Gluten-Free Breakfast, Brunch & Beyond” by Linda J. Amendt. 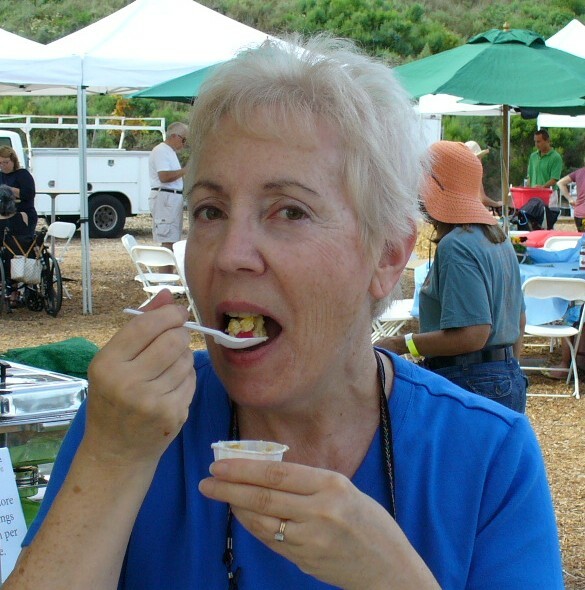 Linda J. Amendt has made a name for herself in Southern California (as well as other states) as a canning and preserving expert and a food-contest judge. 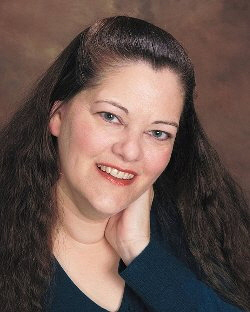 She has won more than 900 awards in state and county fair competitions, and has written three award-winning cookbooks. Gluten-free cooking isn’t exactly her field of expertise. But when she was asked by her publisher to create a gluten-free cookbook, she was ready for the challenge. Though she doesn’t have to avoid gluten herself, Amendt is very, very familiar with the world of food allergies and sensitivities. For years, she has coped with an allergy to the alkaloids in plants in the nightshade family — tomatoes, potatoes, peppers of all kinds, eggplant, okra, and several kinds of berries, to name a few. “I understand what people go through because gluten is used as a thickener (in many foods), and you have to read labels,” she said in a recent phone interview. People with celiac disease — a genetically linked autoimmune disorder — must avoid foods made with wheat or wheat products, which contain gluten. Rye, barley and sometimes oat flours — but not corn or rice — also contain gluten-like proteins. These proteins trigger an immune reaction in the small intestine. It interferes with the body’s ability to absorb nutrients, which creates digestive and other problems over time. Ridding the diet of gluten can help restore the gut’s normal digestive and absorption function. “Gluten-Free Breakfast, Brunch & Beyond” (Taunton Press, trade paperback, $19.95) was born about 10 months later. In it, Amendt covers 100 recipes for quick breads, muffins, scones, pancakes, waffles, French toast, crepes, quiches, omelets and more in 234 pages with color photos. Making gluten-free versions of those foods is doubly difficult: Gluten is what gives baked goods structure and height, as well as flavor. Not only must revised recipes taste good, it’s important for them to look as appetizing as their non-GF versions. Home cooks cope with the GF regimen by using many different grain flours in varying combinations. “There are a lot of gluten-free recipes that require 10 different flours,” Amendt said. She met this challenge by creating two all-purpose flour blends — one that takes the place of all-purpose wheat flour in recipes, and one that’s more like a whole-grain blend. They are made with white-rice flour, brown-rice flour, tapioca flour and potato starch, and are the basis for all the recipes in the book that use flour. Among those recipes are traditional favorites like Zucchini Bread, Buttermilk Biscuits, Blueberry Pancakes, Spice Muffins, and Cinnamon Crumb Cake, and variations like Pumpkin Sweet Rolls, Raspberry Coconut Coffee Cake, Spinach Waffles, Cherry Almond Scones and Cheddar Cheese Biscuits. Besides the recipes, Amendt offers easy-to-read tips for each category and instruction on using starches and flours, baking and mixing techniques, and sources for gluten-free ingredients. She also explains why baking with gluten-free flours is different from using wheat flour. Another tip: Try a narrower baking pan. “Gluten-free batters, when rising, need something to cling to,” Amendt said. “Without that gluten around to support them, they are likely to sag in the center. Or they’ll rise, then fall.” For breads, that means trying an 8-inch-by-4-inch pan instead of the usual 9-by-5. In an extra-large bowl or container, combine the rice flours, tapioca flour, and potato starch. Whisk together until the ingredients are thoroughly blended. Use a large spoon to bring the flour from the bottom of the bowl up to the top and whisk again. Repeat a few times to make sure the flours are evenly distributed throughout the entire mixture. Store the flour in an airtight container or ziptop storage bag at room temperature for up to 1 month. For longer storage, keep the flour in the refrigerator or freezer. Allow the flour to come to room temperature before using. Lightly stir the flour before measuring. Spoon the flour into the measuring cup and level off the top with a straight-edged utensil, such as the back of a knife. Makes about 9 cups. I like to use Grade B maple syrup for baking. It has a stronger maple flavor and darker color than Grade A Amber maple syrup, the type commonly used as a topping for pancakes and waffles. Grade B maple syrup can be found in specialty food markets and some health food stores. Heat oven to 375 degrees. Grease a 12-cup muffin pan with unsalted butter or nonstick cooking spray. In a medium bowl, whisk together the flour, baking powder, xanthan gum, salt and baking soda until well combined. Set aside. In a large bowl, using an electric mixer on medium speed, cream the butter, granulated sugar and brown sugar until light and fluffy, about 2 minutes. Scrape down the sides of the bowl. Beat in the maple syrup. Add the eggs, one at a time, beating well after each addition. Scrape down the sides of the bowl. Gradually stir in the flour mixture. Mix until smooth, about 30 seconds. By hand, stir in the bananas. Spoon the batter into the prepared muffin pan, filling each cup until nearly full and mounding the batter in the center to the top of the cups, or slightly above. Bake until golden brown and a wooden pick inserted in the center comes out clean, 18 to 20 minutes. Immediately remove the muffins from the pan, transfer to a wire rack, and cool the muffins on their sides. Serve muffins warm or at room temperature. Makes 12 muffins. I like to use smooth applesauce in this recipe because it gives the pancakes a velvety texture. Any good cooking apple, such as Gala, Fuji, Jonagold, Golden Delicious or Granny Smith, will work well. Be sure the peel the apple before grating, as the peel can be tough when cooked. Heat a griddle or large nonstick frying pan over medium heat, or heat an electric griddle to 350 degrees. In a medium bowl, using a wire whisk, combine the flour, brown sugar, baking powder, cinnamon, salt, xanthan gum and nutmeg until well blended. Make a well in the center and set aside. In a medium bowl, using a wire whisk, lightly beat the eggs. Gradually whisk in the melted butter until evenly combined, then stir in the applesauce. Whisk in the milk until well blended. Pour the liquid mixture into the well in the flour mixture all at once. Stir just until combined and the flour mixture is moistened. There may be a few small lumps; do not overmix. Gently stir in the apples just until evenly distributed. Lightly grease the griddle with nonstick cooking spray or unsalted butter. Ladle or spoon about 1/3 cup of batter per pancake onto the griddle. Cook until the pancakes rise, bubbles start to come to the surface, and the underside is golden brown, 3 to 4 minutes. Turn over and cook until golden brown, 1 1/2 to 2 minutes more, adjusting the heat if needed to prevent overbrowning. Serve hot with maple syrup, if desired. Note: Individual serving-size containers of applesauce hold 1/2 cup and are the perfect premeasured amount to use in this recipe.